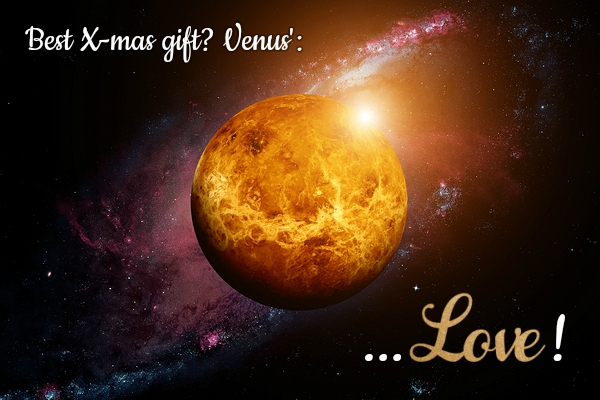 Venus Love - Christmas Day Horoscope! Venus Brings Love to your Christmas Day Horoscope! Venus, planet of love and beautiful things, rocks up in your Christmas Day horoscope, making this one of the best, most romantic and happy Christmases in years! Venus in Aquarius, the friendliest star sign, is teaming up with lucky Jupiter, steady Saturn and exciting Uranus to deliver oodles of Christmas cheer on this very special day. A rare gift! Venus trine Jupiter in Libra brings you happiness, love, luck in relationships, reconciliation and forgiveness, joy and generous gifts. Venus sextile Saturn in Sagittarius brings stability and longevity, helping you plan for the long term. As for Venus sextile Uranus in Aries…that’s what puts butterflies in your stomach! Really, could this day be any more blissful? No it couldn’t. Merry Christmas! Your Christmas Horoscope: How does Venus favour your Star Sign? Venus puts love and friendship at the heart of this very special holiday. How does your Christmas Day Horoscope shape up? Read your star sign and find out! If love is knocking on your door and you would like to know where this is going, our relationship psychics are happy to help on 0207 111 6384. This Christmas is a true gathering among friends, dear Aries. The love extends far beyond your friends and family and into the whole community in your Christmas Day horoscope. You’re feeling connected, plugged in and turned on! There are lots of exciting new people in your life at this moment - and there may even be one person in particular who could truly expand your world, if you’re prepared to go where they take you. You’re electrifying to be around and it’s this that draws everyone to you. A trip abroad to see a friend could introduce you to someone special. Did you just get a promotion, dear Taurus? Or maybe it’s time to make a relationship official? Whether it’s a professional or personal achievement that brings you joy, your Christmas Day horoscope gives you cause for celebration. This couldn’t be simpler. You’re the one in charge of the festivities after all, sitting right there at the head of the table, and everyone awaits your signal for a toast. Single? You’re certainly not interested in superficial infatuations right now. Is it going somewhere? If so, you’re prepared to put in the effort. This is a super-indulgent, pleasurable Christmas! Is your relationship stuck in a routine? Take a holiday, dear Gemini! Travel ignites the fires of love in your Christmas Day horoscope faster than you can say ‘Merry Christmas!’ This will do wonders for your relationship or at the very least show you what you both need in order to be happy. Looking for Mr/Ms Right? A holiday romance could be just the ticket to start the new year on the right foot. What’s more, there’s the potential for longevity. Just pack a bag and let your friends whisk you away somewhere! You’re feeling happy and your popularity is off the charts. Your Christmas Day horoscope brings you really intimate moments to cherish, dear Cancer. You thrive when you’re among people you love and trust, seeing their smile when you give them a beautiful gift or serve them the gorgeous food you’ve painstakingly prepared. You’re in for some wonderful family Christmas moments and you’ll quite likely also receive a gift you'll love. A career breakthrough or house move could also be a cause for celebration. Single and looking for love? Someone you thought you knew reveals a hidden side to them that you find very attractive. A love relationship is at the heart of your joyful Christmas Day horoscope this year, dear Leo. If you’re separated by a few miles - or a few thousand miles - from your sweetie, then travel is a must! Never mind Mercury retrograde. Jump into the car, plane or train and get yourself over there pronto! This will show you’re serious and it will cement your love. Even if you have your sweetheart right there by your side, travelling together will give you one of the most beautiful, loved up Christmases to remember! If you’re single and looking for love, your prospects look fantastic. Just step out your door! Your Christmas Day horoscope is all about cherishing small pleasures, dear Virgo. And that’s not to be sniffed at. What’s a happy life after all if not a series of truly happy moments? You get enough of these to string them together into a beautiful perl necklace as long as the eye can see this Christmas. You’re surrounded by your family and loved ones and doing what you enjoy most. Giving. A special someone could surprise you with an amazing gift in return or it could be a work bonus that makes the difference this year. You’re feeling happy and could put on a pound or two as a result. You’re the luckiest sign of all this Christmas, dear Libra! Venus, your ruler, rocks up in your house of true love in your Christmas Day horoscope making you the hottest thing around! You’re full of life, generous and eager to meet the world. The outcome? The world welcomes you with open arms and your popularity soars! A handsome stranger could sweep you off your feet or you could fall in love with your sweetheart all over again. Do we hear the sound of birds singing and children giggling in the distance? This is a truly gorgeous Christmas, exciting, aspirational and very romantic. Can you feel the love, dear Scorpio? You don’t even have to go anywhere… Love comes and finds you right here in your very home in your Christmas Day horoscope! The house looks beautiful and a gathering of family and friends is a smashing success - pleasant, joyful and full of love. Make it an open house. It’s time to forgive and let bygones be bygones. Money may be tighter than usual, but you feel that this time it’s worth it. And you don't need much to be happy right now. Are you newly in love? It may be time to meet the family… Steal a moment with your sweetheart under the mistletoe. Love knocks on your door in your Christmas Day horoscope, dear Sagittarius. Single? Get ready to mingle - and not just because it rhymes… Your immediate vicinity is full of exciting, attractive, fabulous people! Love at first sight? All you have to do is accept the invite. Your witty banter and sense of humour are truly well received. This is a happy Christmas for loved up Sagittarians too and you’ll have plenty of opportunity to express your love. Expect happy times among friends and a chance to showcase how much you’ve grown. Count your blessings, dear Capricorn! Your Christmas Day horoscope brings you untold riches. Time to appreciate the wonderful people in your life, your family, your home, your loving relationship, your job and the income it brings allowing you to buy gorgeous presents, or the delectable spread on the dinner table. Your home is buzzing with excitement and you want to rise to the occasion and enjoy the best that life has to offer. Single? What are you looking for? This day shows it to you loud and clear. This is a truly aspirational Christmas full of pleasure and delight. Your personal charm is off the charts on your Christmas Day horoscope, dear Aquarius! Venus crowns you the fairest of them all. With invitations flowing in and your chat up lines on top form, you are sure to have no shortage of suitors and admirers! This is a time for love, joy and much happiness. If you’re already loved up, you may be toasting a personal achievement or celebrating your love among friends. A trip - whether abroad or close by - could be just the ticket for the most marvellous Christmas ever. Venus is in the most mysterious part of your chart, dear Pisces, and this makes for a truly magical Christmas Day horoscope! Love blossoms in secret places and away from prying eyes on this very special day. Light a candle; say your prayers; steal a kiss under the mistletoe surrounded by colourful Christmas lights… It’s all about creating that special kind of magic this Christmas! And sure enough, you’ll feel that warm feeling rising up inside. There's love, generosity and good feeling all around and this gives you a real sense of achievement. An unconventional gift could be on its way.